Mild cleansers deodorize, freshen & clean, while conditioners moisturize both skin and coat for a healthy shine. 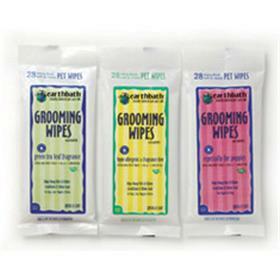 Earthbath wipes contain no animal by-products (lanolin-free) or alcohol and will not remove spot-on flea control products. Heavenly scented with the natural extract of Green Tea Leaf and mild cleansers that freshen and deodorize as the anti-oxidant properties of Green Tea Leaf extract protect from environmental damage. For furry friends who need a good cleansing, but may have sensitive skin or allergies. Mild cleansers freshen and deodorize, while succulent conditioners leave a healthy shine and supple coat. Extra gentle to give puppies the tender loving care their sensitive skin and coat deserve. Blended with a dash of baby-fresh cherry essence will leave your precious puppy smelling better than ever before.